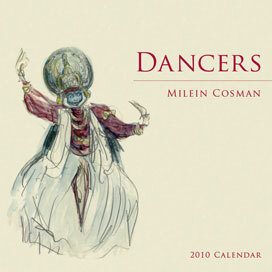 Plumbago Books and Arts are proud to release a new 2010 Calendar with illustrations by Milein Cosman. 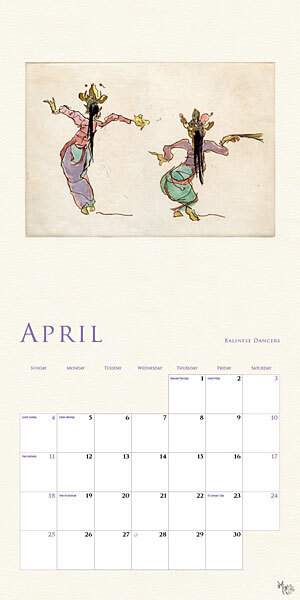 Entitled ‘Dancers’, it gathers images from round the world, especially the Far East. The expert typography is once more by Julian Littlewood. Already hailed as an exceptionally beautiful production, it is the centrepiece of an exhibition of 49 works featuring dancers by Milein Cosman at the New End Gallery, 27 Carnegie House, New End, Hampstead, London NW3 1JE (0207.443.5557) running from 24 November to 20 December. 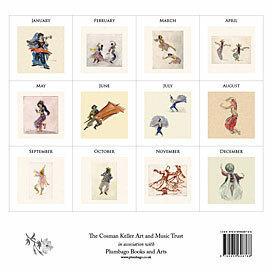 The calendar is priced at £9.99 and is also available from the Courtauld Gallery Bookshop, Somerset House, London. The artworks in the exhibition are also for sale. Milein Cosman was educated in Düsseldorf and Geneva before coming to England in 1939 to study at the Slade School of Art (based in Oxford during the war). After the war, she settled in London where she worked as a freelance artist for national and international magazines and newspapers, and as a book illustrator. In 1958 she devised and presented a series of schools programmes on drawing for ITV. Her first solo exhibition held in London in 1949 was followed by many other shows in the UK, Europe and America. Her work is in several leading British collections, including the National Portrait Gallery, the British Museum, and the V&A in London, the Ashmolean in Oxford, the Fitzwilliam in Cambridge, and the Hunterian in Glasgow; she is also represented in many public and private collections abroad. Permanent exhibitions of her drawings and prints of musicians can be seen at the Wigmore Hall in London and the Palais des Beaux-Arts in Brussels.